A slice of nightmarish fun. Guacamelee is, hands-down, one of the greatest Metroid-vania style games around. It’s bright, vibrant color scheme and tongue-in-cheek sense of humor, with a dash of homage to classic game titles, makes it stand out from the crowd and Drinkbox Studios deserves the praise they received about the game. Needless to say, I had high expectations going into their recent game, Severed, available exclusively on the Playstation Vita. 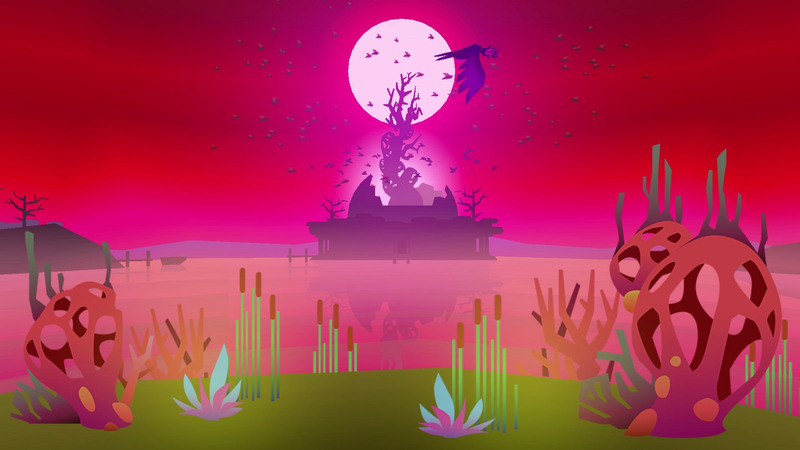 In Severed, you play as a young girl who wakes up in the ruins of her home in a nightmarish fantasy world. With her left arm missing and a ghoulish monster pushing her to explore, she sets out into the world to locate her missing parents and brother, armed only with a special sword. Along the way, she meets a two-headed crow, a rainbow-colored arm, a slightly crazy old hag, and a horde of monsters set on killing her. And, that’s really it. The story in Severed is paper-thin and simple. Normally, I’d be upset at this but it somehow works and fits for this game. Part of the reason it works so well is that you witness the main character going to great lengths to rescue her family. It evokes consideration of how far you’re willing to go to save the ones you love. You even witness the main character grow more violent, as her outfit slowly begins resembling the monsters of the land. With as little dialogue as there is in Severed, the silence speaks volumes to set the mood. One of the things that Drinkbox Studios does well is to pay homage to classic games. While playing Severed, I saw themes of Legend of Zelda, Metroid Prime, a dash of Dead Space, all blended together to make an incredibly addictive dungeon-crawling experience. It’s clear that the game was made by gamers and it’s nice to see how classic games have influenced this one. But how does it play? 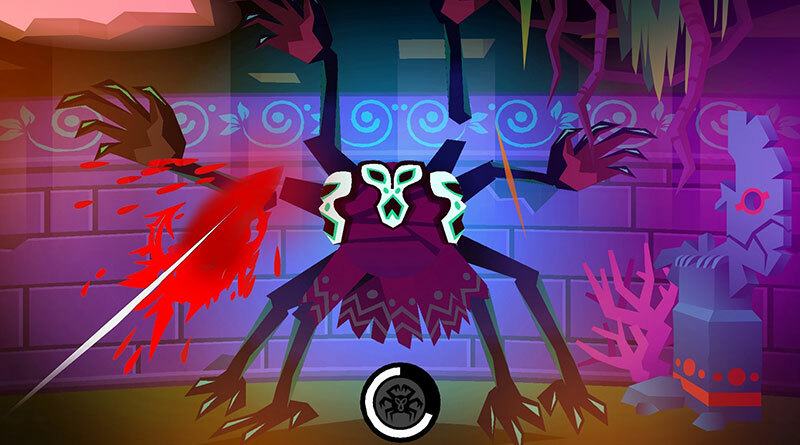 The core gameplay of Severed involves fighting enemies in one-against-one or one-against-two, -three, -four, or more battles. The battles at the beginning of the game are straightforward and accessible. As the game progresses, and you begin fighting more enemies at a time, the difficulty scales accordingly. During the third quarter of the game, the enemies have buffs that allow them to regenerate health, take less damage, inflict more damage, and be immune to magic attacks. You’ll soon find yourself having to strategize and prioritize which enemy to take down first. Luckily, the game gives you two magic attacks that allow you to either freeze enemies for a short while or absorb enemies’ buffs, giving them to you. Even with these abilities, the game can still be difficult. It can become frustrating at times but it’s oddly refreshing in a Dark Souls/Bloodborne sense. Severed is not a game to be taken lightly. Upon defeating enemies, if your “focus meter” is full, you’ll be able to slow down time and ‘sever’ limbs from your opponents. You’ll then use these limbs as currency to level up your attacks, defenses, and magic abilities. It’s a morbid mechanic that, while it makes sense in the scope of the game, might be off-putting to some. The dungeons you’ll fight through are complex. You’ll encounter areas that you cannot open the first time through. As you play the game, you’ll unlock new abilities that will help you fight other enemies but also encourage you to backtrack to previous dungeons in search of loot, upgrade parts, or heart/brain pieces to upgrade your health/mana meters. See, I told you the game resembled Legend of Zelda in a few ways. Unfortunately, the game’s fighting relies solely on the touchscreen ability of the PS Vita. While this certainly sounds like a cool idea and is fun initially, it’s often frustrating. I ran into situations where a swipe wouldn’t register at all or not in the way I had intended. The touchscreen swiping is probably my least favorite aspect of the game, which is ironic considering it’s the main reason it’s on the PS Vita. 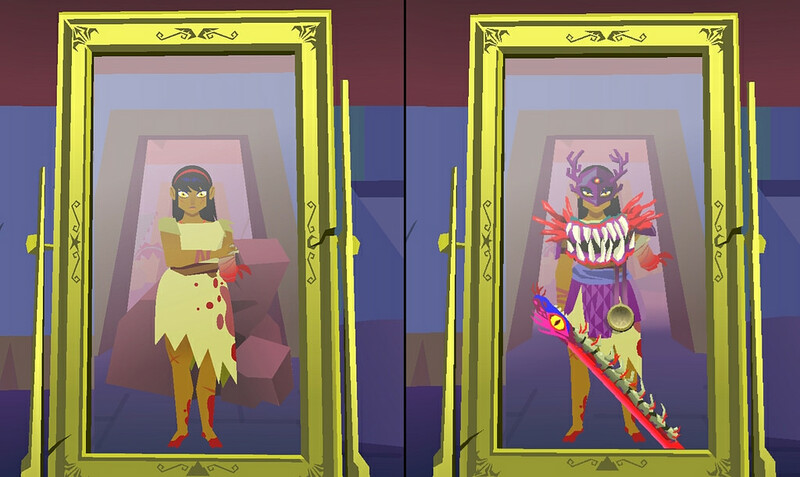 Let me make this very clear, deer readers: Severed is a dark, nightmarish tale of a game that is illustrated with vibrant colors. Before buying, look at some screenshots (I’ve provided some in this review) and watch a few gameplay videos to determine if it’s something you’ll find worthy of playing. That being said, I enjoyed my time with Severed. So much so that I obtained the Platinum Trophy, though it’s not exactly a difficult one to get. But overall, this is a difficult game for me to score because, mechanically, it’s rock-solid, for the most part, and it has a lot going for it. However, the morbid atmosphere of the game is a bit off-putting, as are the touch-screen controls. I’ll need to play countless hours of Guacamelee to cheer myself up. 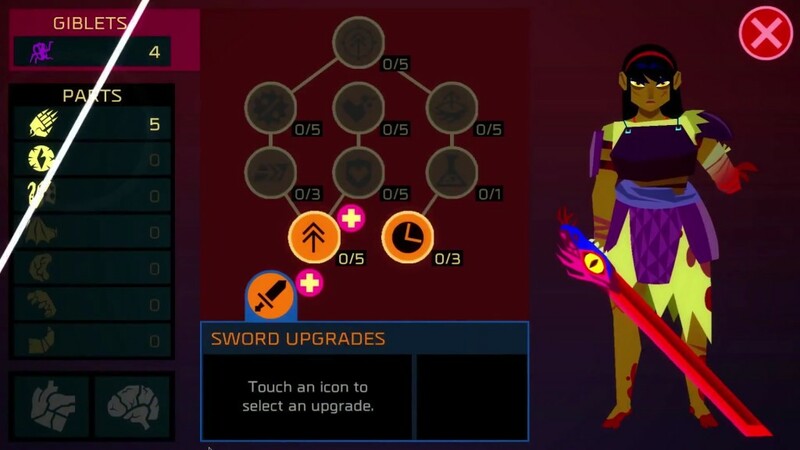 I give Severed a 3.5 out of 5.